My husband absolutely loves mustard greens. If I served them everyday he would eat them happily. Before we met I had never even eaten greens much less knew how to cook them. Having grown up in Seattle I have always been great with fish and seafood dishes, but greens were an absolutely foreign idea to me. The first time I had greens was at a restaurant and they were braised. Absolutely delicious and amazing! After eating them that first time I scoured the internet for ways to cook them myself at home. My husband was no help since he had eaten a lot of greens, but had no idea how to cook them himself and my mother-in-law never served them. For the first couple of years I made traditional greens with a smoked ham hock or braised in olive oil and they were great. However, eventually I became bored with the same ways of preparing them over and over again. So I have branched out and tried new recipes and methods of cooking. One of my favorite preparation methods is to use greens in pasta, so I was enthusiastic when a recent issue of Eating Well magazine had a recipe for Pasta alle Erbe that utilized large amounts of mustard greens. This recipe has 9 ingredients. It takes 40 minutes of total time, all of which is active and makes 8 servings. I had no problems finding any of the ingredients at my local grocery store and made no ingredient modifications. Since the recipe gives a variety of choices for the greens used I choice to use mustard greens, since they are very popular in my household. Instead of whole-wheat fettuccine I chose to use regular fettuccine. Recently, I have been serving a large amount of whole-wheat pasta and my family has become a little burnt out, so I chose to take a break from it for a week. My sauce was pretty watery at the end of the cooking time suggested by the recipe so I allowed the sauce and greens to cook a little longer until all the liquid was absorbed once it was added to the pasta. I followed the remainder of the recipe as written. With only costing $1.50 a serving and full of vitamins this recipe is perfect. My husband and I thoroughly enjoyed this dish. The taste of the greens complimented the sweetness of the tomato sauce giving the finished dish a unique flavor. Make sure to wash the greens very well or your pasta will be gritty (because of the sand). Overall, a delicious recipe full of flavor and a great way to eat more greens. 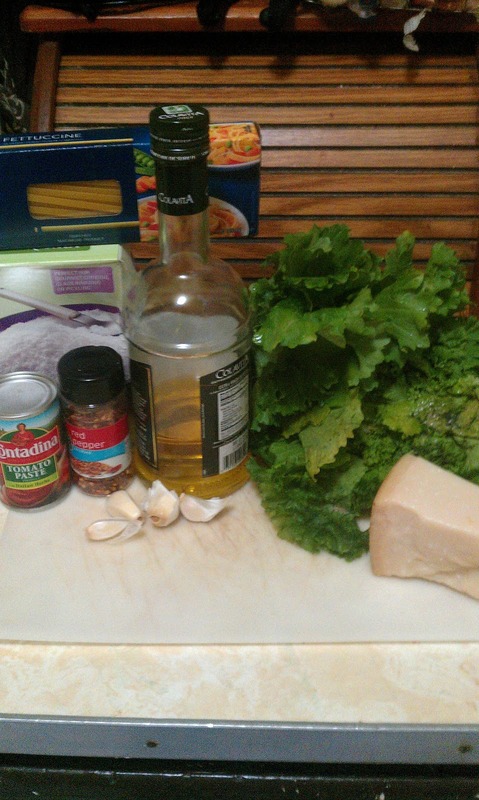 For the recipe go to Pasta alle Erbe. I needed a fresh new recipe for greens..yum. I apprecite the tips you added. It is a great way to make greens, I hope you like the recipe if you try it! That sounds delicious! I often times add greens - sautéed - to pasta, and gnocchi and generally use Kale, or chard. I have never tried mustard greens - will definitively need to try them. I use kale a lot also, it tastes great in pasta recipes! Mustard greens have a pretty mild taste and I use them very frequently, plus they are child friendly!